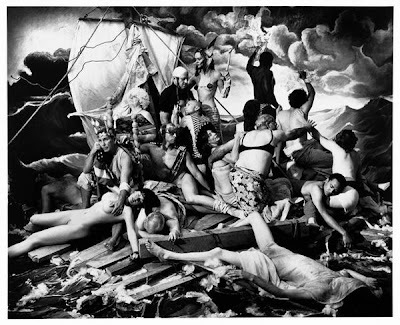 (Notes on) Politics, Theory & Photography: Joel Peter Witkin Imagines Bush's "Ship of Fools"
I don't really understand why you think David Schonauer is being perplex about witkin's picture. First, you forgot to quote this: "But, ..., we think it is brilliant political allegory." And then, maybe what Schonauer meant is that Witkin is not really subtle in that composition. Sure, it's based on a great piece of art, so maybe it gives him some kind of credibility, but he's just screaming "I don't like bush" in that photograph. Any 14 years old can do that. Thanks for the comment. If DS thinks it is brilliant political allegory, why is worried not just about this work (which he thinks is brilliant, after all) but about the propriety of artists engaging in such political statements generally? That is the nature of his question. He seems to think it somehow illicit for artists to undertake such projects. It may be that the work could be improved, or that some alternative medium or more subtle content would be more effective politically. But that is not DS's concern. He is (on my reading) concerned about whether artists should engage in politics at all. I think artists should express their point of views through their own work. It would be no different than filmmakers creating movies based on their beliefs, or just someone who lets the world know what they believe in. He definitely is speaking his mind and obviously he has a negative outlook on the Bush Administration, but it's his right to express it.